Wide open spaces and views just north of 144th - Four Bedroom Ranch with new roof on 2.57 acres includes 9 garage bays! Updated throughout! Vaulted ceilings in formal living room, opens to formal dining area, convenient to kitchen. Gleaming kitchen offers generous Quartz counters, pantry and all appliances; eat-in kitchen area that opens to a family room with vaulted ceiling, exposed beams, brick fireplace and french doors. Two large 700+ sf patios, front patio tiled in slate. Main level offers master bedroom w/huge walk-in closet, private two sinks and 3/4 bath. Lower level includes large bonus room, and three additional bedrooms, each with walk-in closet. Full bath w/beautiful tile detail. Three-car garage attached to home with 6+ additional bays in two more garages. 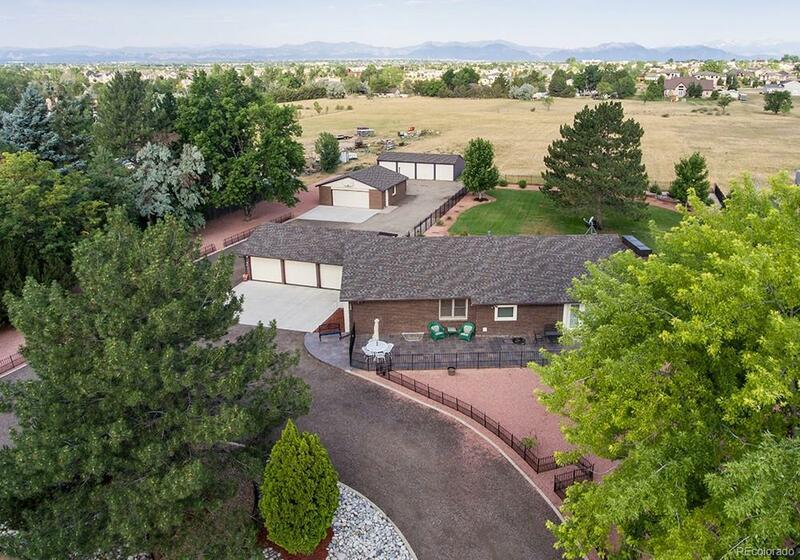 Backyard views to open field and mountains, there are so many possibilities for this exceptional horse property. Incl whole-house back-up generator. No HOA.